Several years ago we fell in love with the beautiful Sunshine Coast, a peninsula a short 40 minute ferry ride from North Vancouver, BC. We were drawn to the pristine beauty of Pender Harbour, often named “The Venice of the North”. With its captivating waterways, incredible hiking, swimming, etc., it is a playground for the outdoor enthusiast. When we stumbled across the uniquely constructed geodesic home on the harbour, the seeds were planted to fulfill our dream of building our business. We, Michel and Helen, both have European backgrounds and speak several languages. Michel grew up in Paris, France, and immigrated to Canada in 1975. Although all his family still lives in France, he loves Canada. He has worked as a professional driver for over 30 years. Michel is a wonderful cook, and enjoys outdoor activities especially swimming. He is bilingual in English and French and has a good working knowledge of German. Helen, although born in Canada, grew up in a Swiss home speaking both Swiss German (Schweizerdeutsch) and English. She has always had a fascination with languages and culture. Helen holds a masters degree in teaching second languages and has over 25 years of teaching experience. She has spent many enjoyable years teaching English as a Second Language. Now retired from the school district, her wish is to continue to use her love of teaching. 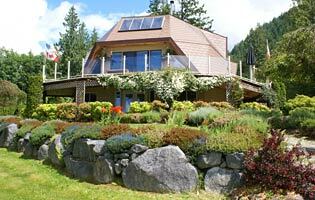 We welcome you to come and share our little paradise in Pender Harbour.